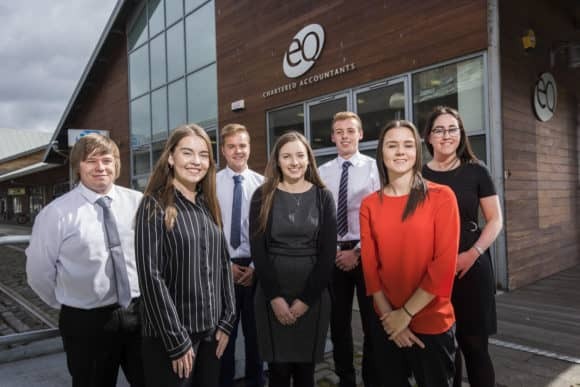 A group of seven new Chartered Accountancy trainees have taken up posts with leading accountancy firm EQ Accountants LLP. This year’s intake, who recently gathered at EQ’s Dundee office for training, will be spread across all offices, with two trainees based in Dundee, Forfar and Glenrothes and one in Cupar. While providing opportunities in the local area, the investment in trainees will also help support the future growth of the firm, which now employs over 100 staff and 15 Partners. The new trainees are Sean Grubb (21), an Accountancy graduate from the University of Dundee; Lauren Carroll (22), a Scots Law graduate from the University of Dundee; Jodie Ovens (22), a Business and Accounting graduate from the University of Edinburgh; Rikki Jenkins (22), an Accountancy graduate from Edinburgh Napier University; Fraser Johnston (21), an Accountancy and Finance graduate from the University of Stirling; Rosaline Watson (22), an Accountancy and Finance graduate from the University of Stirling and Jayne Thoms (21), a Geography graduate from the University of Dundee. EQ offers an intensive, three-year training programme which is unrivalled locally when it comes to the experience, training and funding which graduates benefit from. As well as being exposed to a broad range of assignments, with client responsibility from early on, graduates receive training in accountancy, taxation and audit, with IT, business advisory support and personal skills training also provided. Welcoming the group to EQ’s growing workforce, David Cameron, Managing Partner commented, “We are delighted to be investing in this new and talented group of young people, and welcome them to EQ. Our graduates enjoy a truly rounded experience rather than being pigeon-holed too early, while gaining responsibility for a portfolio of clients early in their careers. With offices in Cupar, Dundee, Forfar and Glenrothes, EQ’s annual turnover is £7M.